Tom works in financial PR and loves spinning tunes. Alice is a foodie who previously worked at a food charity in the UK and now lives her passion in food PR. 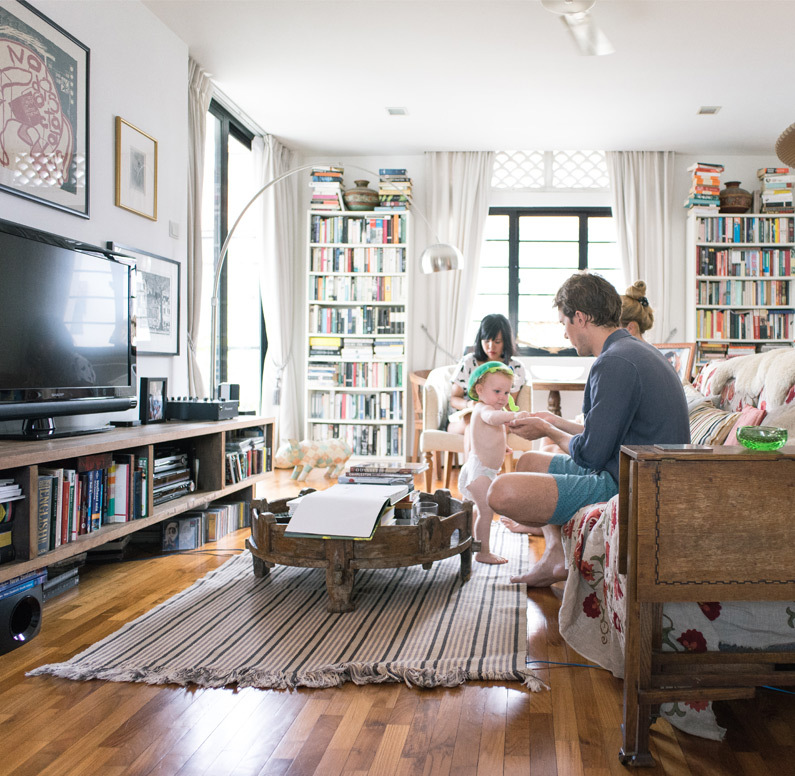 Both of them moved to Singapore almost three years ago where they created their home in a Joo Chiat walkup, filled with art, antiques and 700 books. Tom and Alice welcomed a new addition to their treasure trove just over a year ago – baby girl Iris. What was the very first piece you bought? Alice: We bought pieces individually before we met; both of us grew up surrounded by art, so we started accumulating quite early on. Some of the pieces in the living room were from our childhood, some were from our younger days, and for instance the woodcut print is a scene from Regent’s Park College in Oxford where Tom studied. Tom: We got some pieces together at this wonderful gallery in London right by the British Museum called Abbott and Holder. It has been around since the 1940s and it was founded on the premise that every nice picture should be affordable for everyone. The gallery is almost like a records store – racks and racks of watercolours, prints, drawings, oils, ranging from 50 to a few thousand dollars. It has something for everyone, and if you browse hard enough, there are pieces by famous artists at very affordable prices. We love gems like this and we get quite addicted to sniffing out pieces in there. How has your collection grown? Alice: We both come from families who like art. Tom’s mum is a photographer so he tends to be more influenced by contemporary ideas and colour. My parents have always loved traditional art so I gravitate towards the older style of painting, and antiques! We have quite an obsession with the Bloomsbury group, a group of English writers, philosophers and artists, which Virginia Woolf was a part of. We like that “folky” style a lot, in fact one of our favourite pieces is an aquatint work by Norman Ackroyd of the garden at Charleston, the home and country meeting place of the Bloomsbury Group. Since moving to Singapore, however, we have tended towards furniture and antiques and we picked up a number of amazing antique pieces from this French dealer in Tiong Bahru, Aphorism Antiques. Our favourite is this wooden statue of a luohan – it’s from the Ming Dynasty and you can smell its age by sniffing it. It has this small hole at the back where you can put your prayers in. Tom: Yes we are quite drawn towards the “clan houses” here, and there are so many hidden shops in Singapore and in the region where we can uncover gems from that particular aesthetic. We found this interesting wooden Burmese gambling dice while travelling, each face of the dice covered with an animal. I also bought this Tibetan cupboard covered in weird mystical creatures from Expat Auctions in Singapore – it is a bit creepy but apparently the creatures are there to ward off evil spirits. We’re looking out for some Peranakan tiles, or Chinese seal-stones, the detail is impressive and we like the cultural connection of these objects. Where do you buy art in Singapore? Alice: A lot of our pieces here were actually shipped over from the UK but we got them reframed in Singapore. We were lucky to find a really good framer. We’ve framed some postcards and sketches which I bought in Paris years ago, an English train poster, and even this handmade tapestry by a tribeswoman which we purchased in Laos that was meant to be a baby-carrier – putting something in a frame can create a new context altogether. Tom: We’d quite like to get our hands on more art by local artists before we move back to the UK in six months’ time. We came across the works of a Singaporean second generation artist, Chen Cheng Mei, and really loved the colours and style of her oils. We purchased a painting by her brother, Tan Teo Kwang, when we chanced upon Tzen Gallery while walking around in Tanglin Shopping Centre. We have a piece by British artist, Leo Poloniecki, who’s based out here in Singapore. It is quite different from the other pieces we have, more abstract and colourful, and his prices were reasonable. Our neighbor living upstairs does some Chinese ink painting and we might try to get a piece from him before leaving Singapore. We do visit galleries and exhibitions, but in general we like to discover a cool spot somewhere, unexpected, and full of wonderful little gems. We came across Thow Kwang Pottery Jungle off Jalan Bahar, surrounded by some kampung houses. Some time ago I heard about this records store called Red Point on Playfair Road via a podcast and that was a real gem, tons and tons of vinyls and records! Alice: We found a number of really nice places in Singapore- Aphorism at Tiong Bahru, or Hock Siong where we get our furniture fix – there are tons of vintage furniture at affordable prices in their Tai Seng warehouse space. 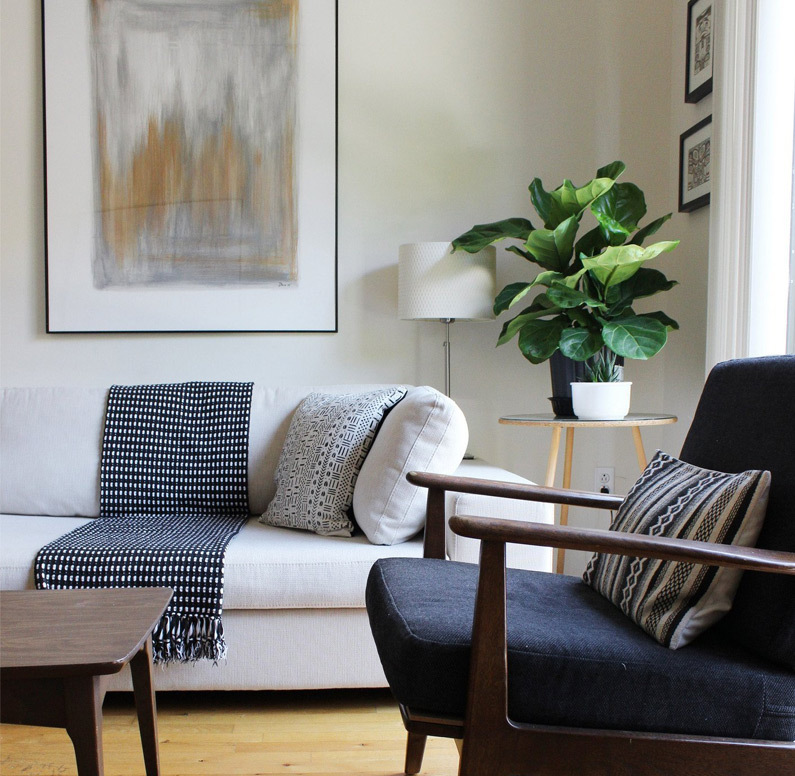 We can upholster our furniture cheaply and beautifully in Singapore, one of our go-to places is E&A Interiors, which was set up by my friend who is an interior designer. They import quality fabrics from Europe and North America with beautiful block prints, some of which are printed by hand. How do you afford to buy art? Alice: Admittedly the art in Singapore is more expensive, but it could be a result of us being more familiar with London where we know where to sniff out bargains. We try and set ourselves a budget when buying art but don’t always end up sticking to it, especially if it’s something we really like! Tom: Truth is, a couple of months later, you will always remember that piece you bought, not your credit card bills! Anyhow, now that we have Iris, we have to think about saving some money for her and not spend all our money on art. Any practical concerns/considerations in selecting artworks? Alice: We left some of our more special pieces in the UK as we were afraid that the oils and watercolours would bleed. We were initially quite concerned about the aquatint and some lithographs by Duncan Grant as they are delicate pieces and we weren’t sure how it would react in the Singapore weather, however, it seems to be holding up well. We bought a dehumidifier a while back, however we haven’t really used it and to be honest, we’ve never had any problems with humidity even though the sun streams into the living area and we leave our windows and doors open a lot. We probably see more effects of the Singapore weather on our furniture though – one of the chairs has all these discoloured spots, but we don’t really mind as we can just cover it with something from E&A interiors. Attilio Rapisarda is a 42-year-old Singapore Permanent Resident, originally from Sicily, Italy. Attilio has been living in Singapore for seven years, working in psychiatric research and, more recently, teaching medical students. He trained in both digital and film photography at the Photographic Society of Singapore and Objectifs Centre for Photography and Filmmaking. His main photographic interests lie in the area of performance art but he has also published in the domains of food and architecture photography, on websites and magazines distributed locally and overseas. A freelance art writer currently based in Singapore, I was a regular features contributor to The Pocket Arts Guide covering contemporary trends in Asia. With a background concentration in economic development and social anthropology, my special interest is in the different mediums of sociopolitical art as a tool, genre, expression.